We came across the mosque whilst attempting to visit the old train station (which wasn’t really a site to see). It was the most amazing misadventure! The mosque was just beautiful and so peaceful, it felt amazing to be in there, walking around on the tiled grounds bare-footed. They ask that you take your shoes off and provide you with traditional/religious robes, and head scarves for women. Visiting hours for tourists and public are outside of prayer times. I thought it was a great experience and would recommend it. When you get there and youre a lady, they will require you to wear a burqa. It’s nice to be able to experience that. Only downside is that if youre not used to it, wearing the burqa will make you sweat a lot, especially during lunch time. So maybe visit in the afternoon. National Mosque is among the top tourist destinations in KL, open to even non-Muslims, though their entry timings are restricted, in order to allow the Muslims to offer their prayers. The mosque has vast open gardens and fountains, in the front, which are maintained well. The entry to the mosque is free but every one needs to their legs and head covered. This is a religious requirement for entry into a mosque and everyone is required to follow it. As soon as one enters the mosque, one is greeted by a row of beautiful fountains. On the right is a large hall of pillars which doubles up as a resting place. In front of this hall of pillars is the main hall for offering prayers. Tourists are not allowed to enter this main prayer hall unless they are Muslims, but there is no restriction on anyone, to observe people offering their prayers, from outside the prayer hall. Photography is permitted and it is definitely an attraction worth seeing. Beautiful mosque but if you’re not a Muslim, look up the times you can get in! For non-Muslims there are lots of restrictions including the time, and you will not be able to enter the praying space unless you are a Muslim. However, the staff in front of the prayer space, the lady was very friendly and nice. Also, I met a local Malay man who was very friendly and showed me around a bit. Great experience. 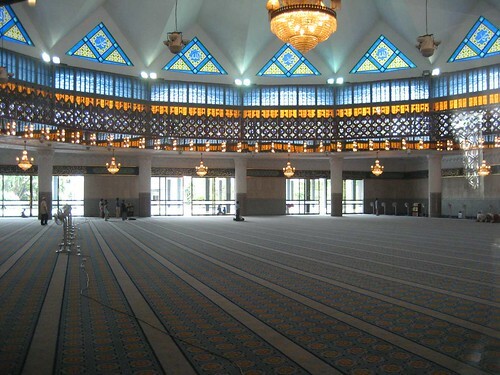 You will not need more than 30 minutes to look around the mosque. If you have never visited a mosque before or have very little knowledge about Islam, this is the place to be. This is a very short visit and takes less than an hour to do so. There are certain visiting hours for visitors, so it is always best to find out which suits you the most. At the entrance, you will be given a purple robe to cover up (except for men who are wearing shirt with long sleeves and long pants) and a head scarf (for ladies). No shoes are allowed. There is a big shoe rack next to the entrance. You are free to walk around the mosque to look at it’s beautiful architecture and interior. Near the main prayer hall, there are volunteers who would be more than willing to explain the history and some information about the building and the religion to you. My friend and I talked to one of the volunteer and she was really nice and friendly. She also gave us some brochures and told us come back later in the evening to observe the evening prayer if we have time. My friend and I learn a lot about Islam from this short visit and it was worth it. 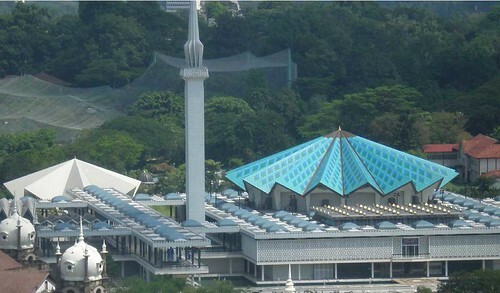 Masjid Negara is Malaysia national mosque. 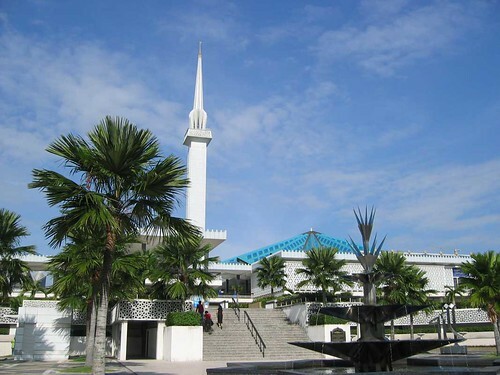 It was built in 1965 and has the most distinctive architecture among the mosques in Malaysia. The national mosque is set in a sprawling gardens that contain pools and fountains. This vast building can accommodate up to 15,000 worshipers. The hall is covered with a distinctive dome in the shape of a stylized 18-point star, representing the 13 states of Malaysia and the five pillars of Islam. Towering over the mosque is a slender 240-ft high minaret. Visitors are welcome to explore the entire complex but must be appropriately dressed at all times and headscarves are mandatory for women. Shoes must be removed before entering the building. 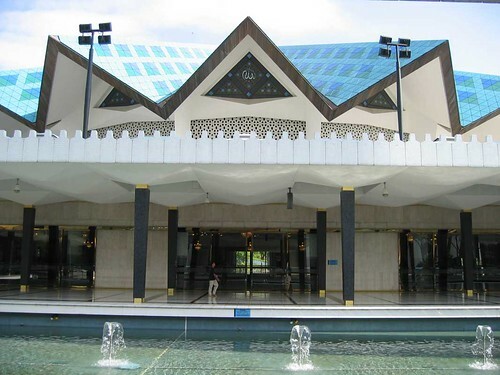 Masjid Negara is open to visitors daily and you should check out visiting schedule at the counter. Almost every parts of the mosque is accessible to visitors except the main prayer hall where it is open only to Muslim. The mosque is located along Jalan Perdana, Kuala Lumpur. The mosque can be reached by taking LRT and stops at the KL Railway Station. Batu Caves – Batu Caves is a 400 million years old limestone hill which consists of a series of caves and cave temples. Tian Hou Temple – The temple was built by the Hainanese community living in Kuala Lumpur dedicated to Goddess Tian Hou (The Heavenly Mother). Saint Mary’s Cathedral – The Saint Mary’s Cathedral is the cathedral of the Diocese of Malaysia. It was built in 1883 and it’s one of the oldest churches in Malaysia. Friday Mosque – The attraction of the mosque is the unique Moorish architecture. It was officially opened in 1909 and was built on the first Malay burial ground. Sze Ya Temple – The temple is dedicated to patron deities of Sin Sze Ya and Si Sze Ya. The deities were believed to have guided Kapitan Yap Ah Loy to defeat the enemies and defend Kuala Lumpur during the civil war (1870-1873). Holy Rosary Church – Built in the French Gothic Revival style, this Roman Catholic Church was inspired and planned by French missionary Fr Francis Terrien.